The newsagent at Camping Cala Ginepro offers numerous magazines alongside local, national and international newspapers, to keep you up to date even when you’re on holiday. What could be better than leafing through an interesting magazine or newspaper, bathed in sunlight with the fresh sea breeze caressing your skin? On the beach, in the comfort of your accommodation or in the shade afforded by the pine forest, you can read to your heart’s content. The tobacconist’s section of the newsagent sells various smoking items, from cigarettes to pipe tobacco, naturally only for sale to adults. If you do smoke, we would ask you kindly to respect those around you, especially children. Please refrain from disposing of cigarette butts on the beach or in the pine forest – always use the dry waste containers! Respecting the environment is crucial in a delicate eco-system like Cala Ginepro. It’s the small things that make the difference! 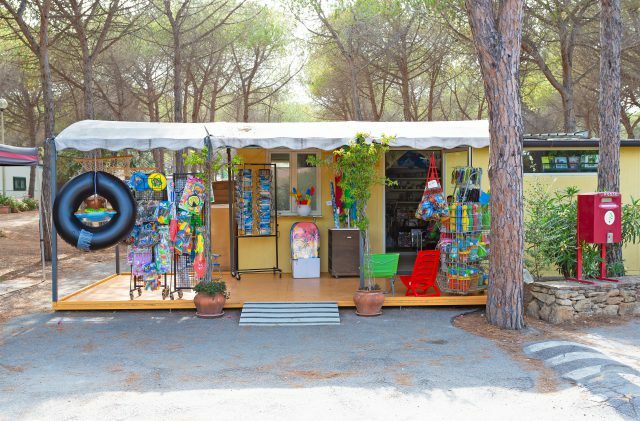 In the bazaar at Camping Cala Ginepro, you will find useful holiday items such as flip flops, beach towels, t-shirts, blow-up beds, buckets and other children’s toys, as well as little souvenirs to take with you and keep or give as gifts when you get home. You can also get top-ups for your mobile phone. And if, like us, you remain a fan of postcards even in the digital era…in the newsagent at Cala Ginepro you can buy all the postcards you could possibly want. The postbox is right at the entrance, with daily collections.